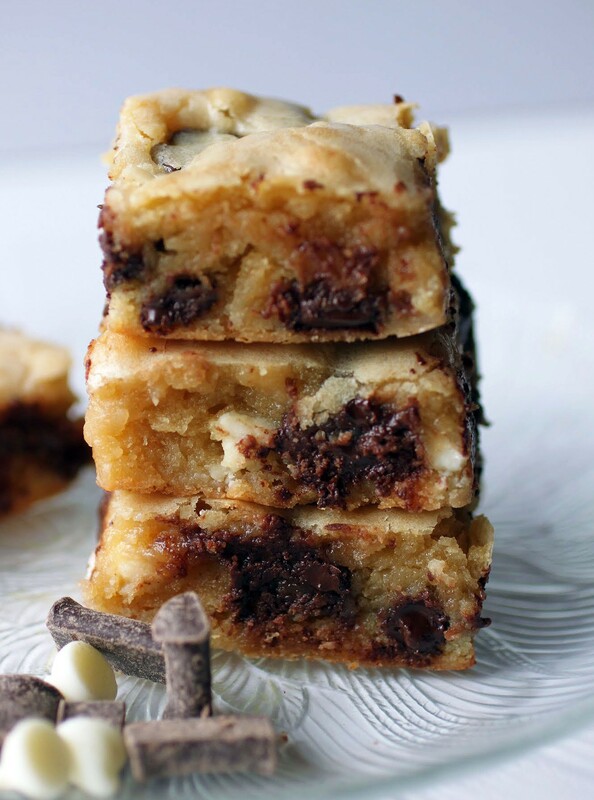 Do you ever go on a brown sugar kick? Okay, that’s my life. I admit it. I have an ongoing love affair with brown sugar that is never going to end. Last week, we accidentally ran out of brown sugar, and I thought I was going to sit on the kitchen floor and cry. No baker worth her salt (or sugar, in this case) can do without the good stuff. 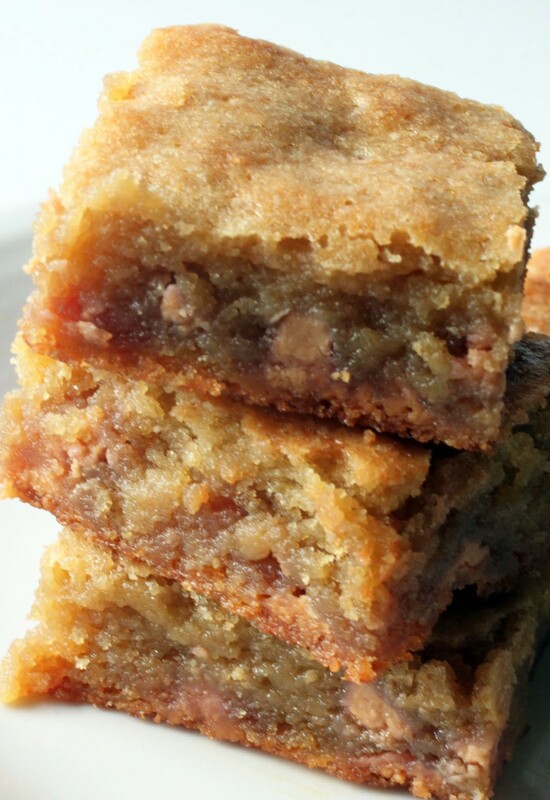 To apologize to brown sugar everywhere and make amends, I made these blondies. 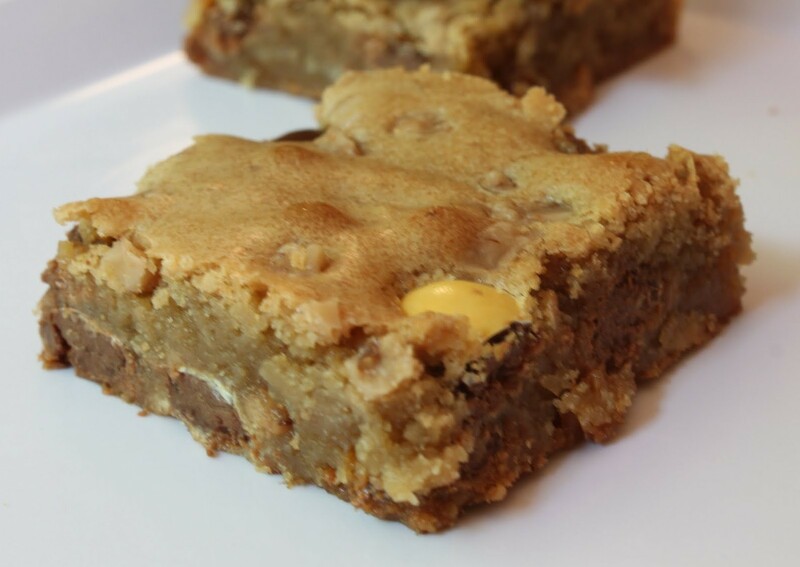 Blondies are the quintessential ode to brown sugar, a bar cookie packed with caramelized goodness. Plus, these are filled with butterscotch chips. That’s the life, baby! Being a social butterfly and all, I get invited places with some degree of frequency. And when I’m attending a party or gathering at someone’s house, it’s pretty likely I’ll be asked to bring dessert. I guess it makes sense. After all, I’m the dessert girl. But every now and then, could I bring a bottle of tequila instead? Sharing is caring, ya know. Oh, well. When I’m asked last-minute to bring a dessert somewhere, an old faithful recipe is the one to save me every time. No, I’m not talking about passing off slice and bake as my own, though that’s tempting. I’m talking about an easy bar cookie. 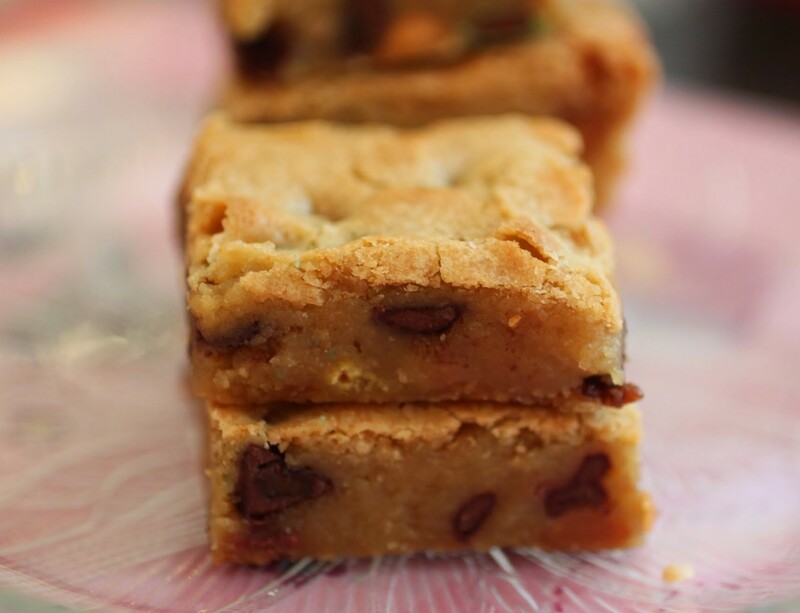 These blondies are chewy, thick, easily customized and, most important, fast. Everyone already ate the Tagalongs. They’re gone. Cue my sad face. 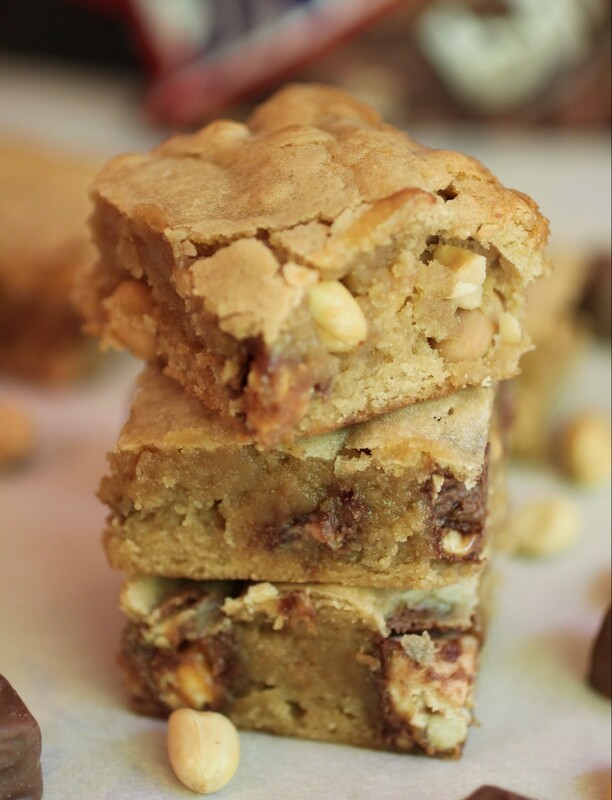 Luckily, I baked a bunch into these peanut butter blondies before they were totally gone, so we got to enjoy them in a different form. Oh, the love. Known as Peanut Butter Patties in other parts of America, Tagalongs are my number one favorite Girl Scout cookie. 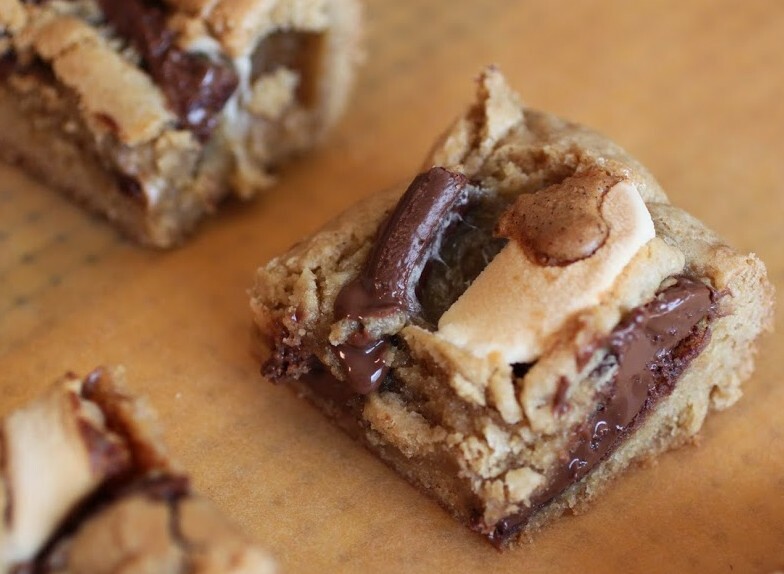 Who can argue with peanut butter and a cookie drenched in chocolate? Stick all that into a dessert bar and we’re just talking pure joy. Why, oh why did this take me so long? Last week I was driving around and suddenly it occurred to me that I just don’t bake with Snickers very much. And why? No good reason! Seriously, folks. What is wrong with me? So to make up for this gross error in judgment, here’s a whopper. 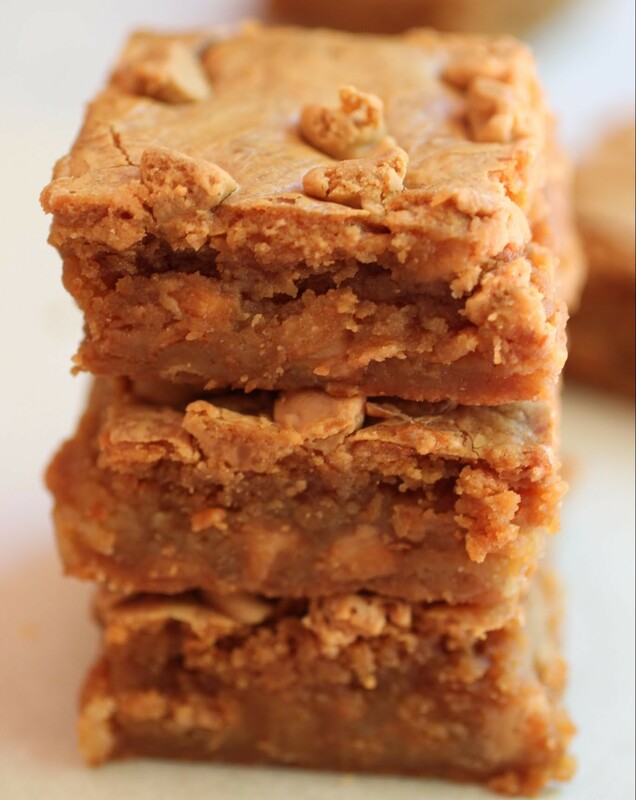 It’s a peanut butter blondie filled with Snickers and peanuts. It doesn’t get any better than this for you lovers of all things chewy, caramel, peanut, and chocolate. And it’s all made in just one bowl, no mixer involved! Welcome to day two of my browned butter week! If you missed day one, check out these browned butter toffee cinnamon rolls. They’re pretty fetch. Yes, I just used slang from somewhere in the 90s. Don’t hate. 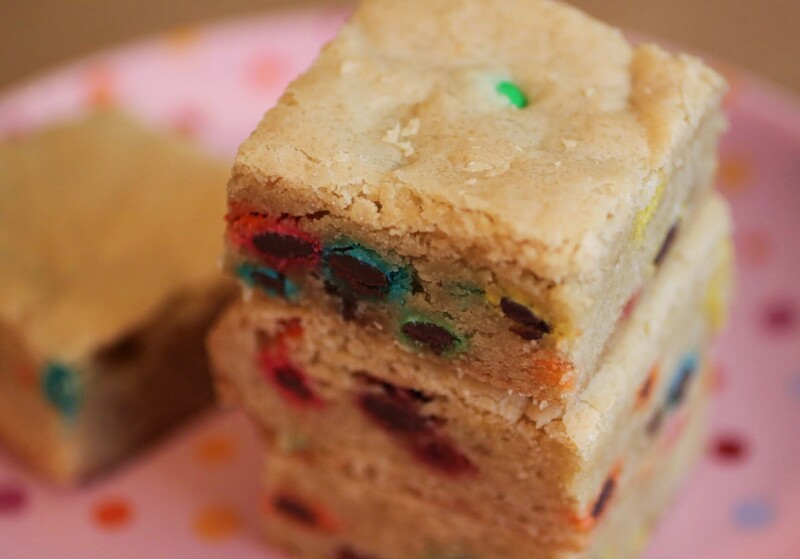 Perhaps these browned butter M & M blondies will get you back on my side? In a few days, Passover begins, and if you aren’t really familiar, it’s like the biggest holiday you can think of on steroids. The food is different, you have to use different dishes, and the spring cleaning involved is insane. Example: me behind the fridge with a toothbrush and a lot of cleaning fluid. I’m in love with Captain Hook. Well, not love, exactly. But if you watch the series Once Upon a Time, which I’ve been binge-watching with Kenny on Netflix, you’re aware that their version of Hook is a heckuva lot sexier than the guy from the Disney movie. I mean, there’s no comparison. If you have no idea what I’m talking about, think Westley from The Princess Bride. This Hook is very similar, but with a bad guy streak. I’m super sold on him. If only I could win him over with my baking. But then, Kenny might not like that. I like to keep my chocolate in the freezer. Have you tried it? If not, I highly recommend. The whole consistency and texture and flavor just changes in this magical way when chocolate is frozen. What eventually happens is that the front drawer in my freezer is full of goodies: M & Ms, chocolate chips, butterscotch chips, peanut butter chips. If it’s got chocolate, it’s in there! So every now and then I have to get rid of whatever is in there and then replenish gradually. It’s the circle of life. Beach Week is winding down, everyone. Big sighs. But everything must end. And I say, go out with a bang, not a whimper! I didn’t make that up. Some really great poet did. 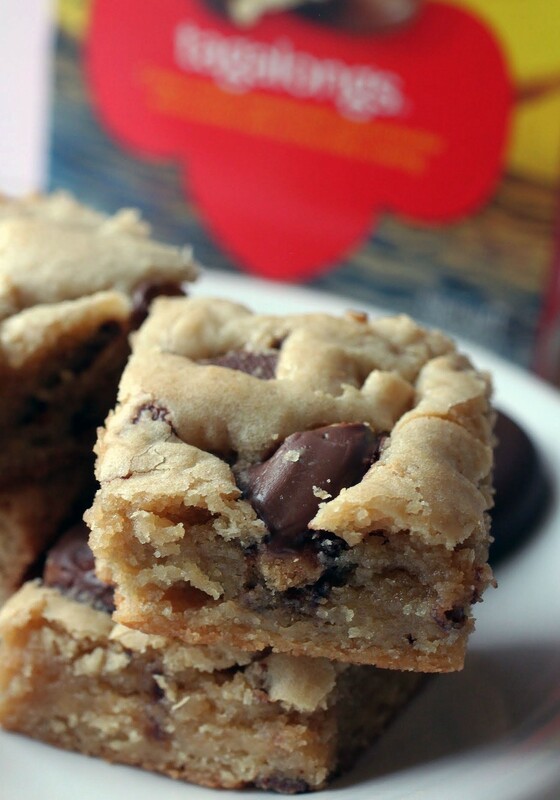 The cookies and bars at beach town bake shops are so wonderfully homemade. No, I’m not counting Starbucks. These shops are owned independently, and you can taste the singularity of each baker’s products. It’s like they’ve baked their souls into their treats. I’d like to believe that I do that, too. 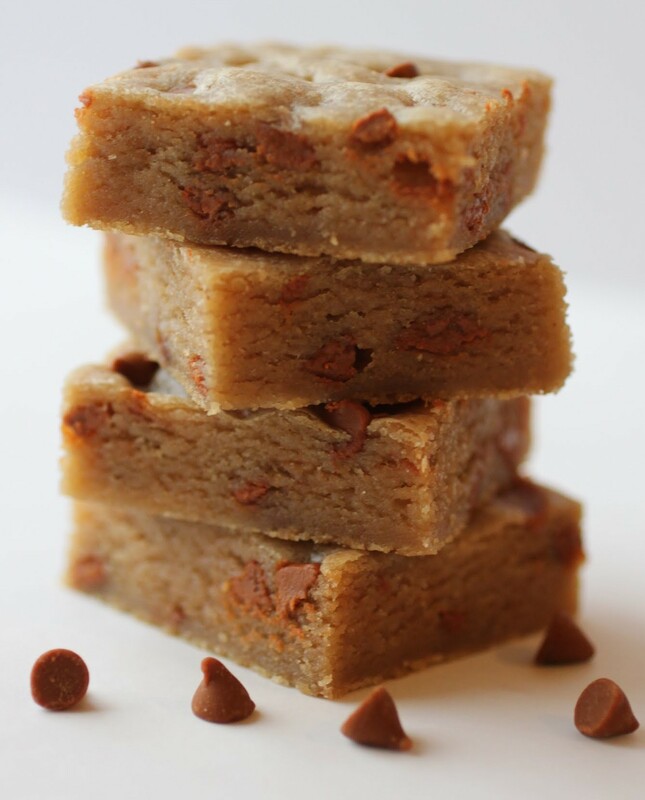 So these Heath Blondies represent the heart of what I love best in baking: caramelly, chewy amazingness. Because what else is there? Oh, except Reese’s.